Isn't that fun? 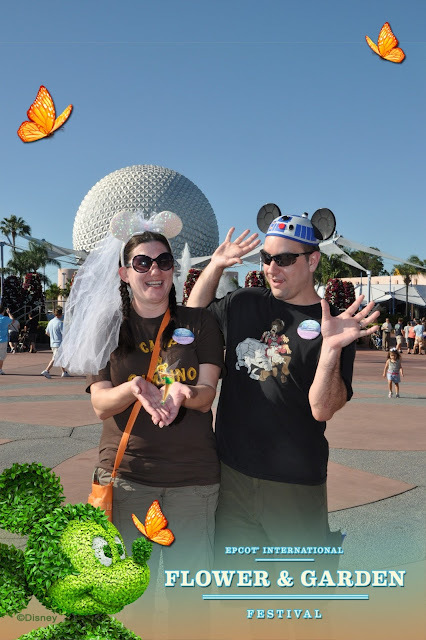 One of my favorite things about the Disney parks is the free Photopass. You get a card from the first Photopass photographer you use, and then you present that card to any other Photopass photographer at any other park or resort and they scan it, and your photos are available online right away! Some photographers suggest (or you can request) these special poses where you can add in characters, like Tinkerbell. You do have to pay to download the photos, but they have good deals on packages, frequent coupons, and you can even make a photo book right there on the website with Disney theming and characters.Our honeymoon photo book was kind of expensive, but how can you really put a price on something you'll treasure forever? We have a busy weekend of activities for Craves, Caves, & Graves ahead, including a City Museum group blog and another trip to Missouri State Penitentiary. I'll try to get some of the pictures from our wedding reception up soon!